View all images from this release. WASHINGTON -- NASA's Mars Science Laboratory will launch two years later than previously planned, in the fall of 2011. The mission will send a next-generation rover with unprecedented research tools to study the early environmental history of Mars. A launch date of October 2009 no longer is feasible because of testing and hardware challenges that must be addressed to ensure mission success. The window for a 2009 launch ends in late October. The relative positions of Earth and Mars are favorable for flights to Mars only a few weeks every two years. The next launch opportunity after 2009 is in 2011. "We will not lessen our standards for testing the mission's complex flight systems, so we are choosing the more responsible option of changing the launch date," said Doug McCuistion, director of the Mars Exploration Program at NASA Headquarters in Washington. "Up to this point, efforts have focused on launching next year, both to begin the exciting science and because the delay will increase taxpayers' investment in the mission. However, we've reached the point where we can not condense the schedule further without compromising vital testing." The Mars Science Laboratory team recently completed an assessment of the progress it has made in the past three months. As a result of the team's findings, the launch date was changed. "Despite exhaustive work in multiple shifts by a dedicated team, the progress in recent weeks has not come fast enough on solving technical challenges and pulling hardware together," said Charles Elachi, director of NASA's Jet Propulsion Laboratory in Pasadena, Calif. "The right and smart course now for a successful mission is to launch in 2011." The advanced rover is one of the most technologically challenging interplanetary missions ever designed. It will use new technologies to adjust its flight while descending through the Martian atmosphere, and to set the rover on the surface by lowering it on a tether from a hovering descent stage. 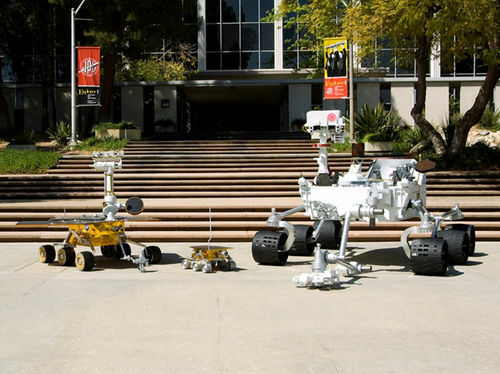 Advanced research instruments make up a science payload 10 times the mass of instruments on NASA's Spirit and Opportunity Mars rovers. The Mars Science Laboratory is engineered to drive longer distances over rougher terrain than previous rovers. It will employ a new surface propulsion system. Rigorous testing of components and systems is essential to develop such a complex mission and prepare it for launch. Tests during the middle phases of development resulted in decisions to re-engineer key parts of the spacecraft. "Costs and schedules are taken very seriously on any science mission," said Ed Weiler, associate administrator for NASA's Science Mission Directorate at NASA Headquarters. "However, when it's all said and done, the passing grade is mission success." The mission will explore a Mars site where images taken by NASA's orbiting spacecraft indicate there were wet conditions in the past. Four candidate landing sites are under consideration. The rover will check for evidence of whether ancient Mars environments had conditions favorable for supporting microbial life and preserving evidence of that life if it existed there.